As I observed ignition of several rocket engines (Shuttle, AMDE, Lynx Suborbital, Saturn V) they all come through a couple phases - emitting various vapors, unfocused flame, etc, before the proper "full thrust" flame appears - sometimes they come slower, sometimes faster (in case of Bantam that's nearly instantaneous). What are these phases? What am I observing - could someone describe step by step, what are the phases between the countdown "zero" and the engine firing at full thrust? 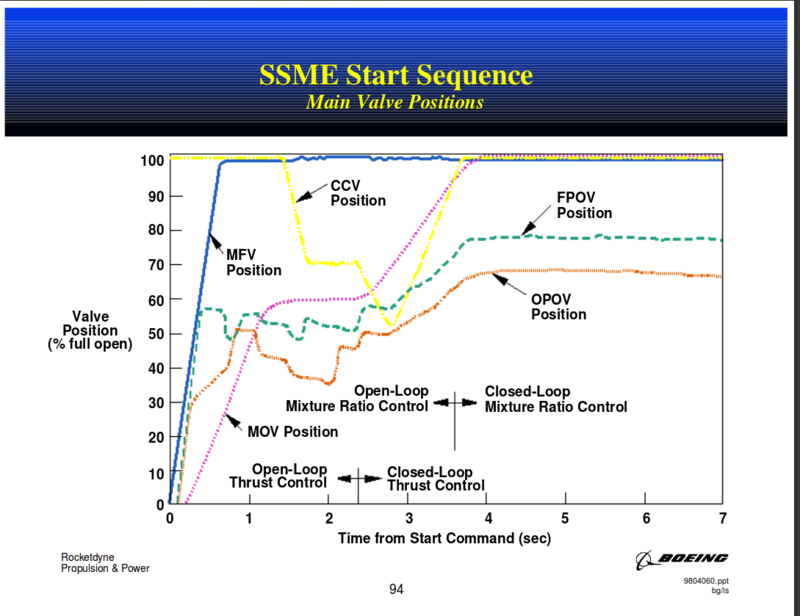 And conversely (like in case of AMDE), what are the phases of engine shutdown? Very late to the party on this one, but I found a really, really, really detailed description of SSME startup here (PDF). Basically, the whole system is started when opening the main fuel valve lets LH2 into the nozzle and main combustion chamber cooling systems, which aren't insulated. The environmental heating to the LH2 causes it to expand, which generates the inlet pressure for the preburners and also gets the low-pressure fuel pump going. After that, the oxidizer system has to be primed in the proper sequence, which are carefully timed to synchronize with wild 2 Hz pressure fluctuations in the fuel system, caused by the heated LH2 trying very hard to flow backward into the pump outlet. Get too much back pressure on the fuel pump outlet and the resistance added to the pump/turbine shaft causes the preburner to explode. Get too little back pressure, and the pump will over-spin and rip itself to pieces. The whole thing is... tricky. 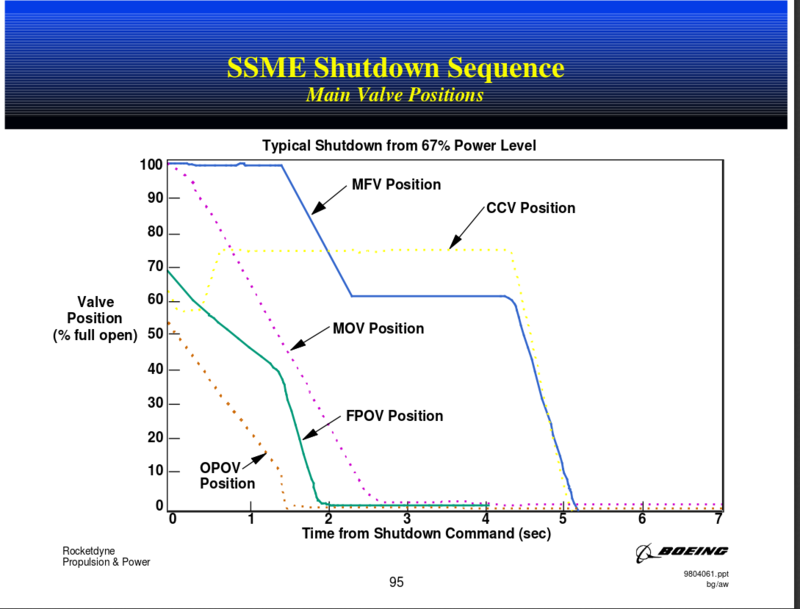 My go-to open source for SSME information has nice graphs for startup and shutdown. There's a bit more going on than is shown in this diagram such as the spark ignitors coming on and off, and the main engine controller stepping through its start sequence, verifying parameters to ensure that start is progressing normally, but these pictures give a very good overall look at start and shutdown. CCV is the chamber coolant valve, routes hydrogen through the nozzle cooling circuits. MOV is Main Oxidizer Valve, basically just a shut-off. MFV is Main Fuel Valve, ditto. OPOV is the Oxidizer Preburner Oxidizer Valve, this valve is controlled by the chamber pressure (aka thrust) control loop. It controls the amount of oxygen entering the Oxidizer Preburner and thereby the amount of O2 pumped by the high pressure ox turbopump. FPOV is the Fuel Preburner Oxidizer Valve, this valve is controlled by the mixture ratio control loop. It controls the amount of oxygen entering the Fuel Preburner and thereby the amount of H2 pumped by the high pressure fuel turbopump. Considering the Space Shuttle main engines as an example and building on Organic Marble's answer, the start-up phases amount to some transient effects while mixing the fuel and oxidizer while building up thrust and developing a steady-state flow out of the nozzle. You'll often see un-burnt hydrogen and clouds of oxygen as the mixing occurs and the initial flame builds up. Although it happens very quickly, it still takes some time to develop the flow to steady-state, so you get a bunch of different phenomena happening like shock cones and plasma. This video commemorating the Space Shuttle from an engineering perspective has probably the best available footage of the SSME's starting up. The commentary does not go into detail regarding the various phases but they provide some information about what you're seeing. Not the answer you're looking for? Browse other questions tagged propulsion fuel engine-design engines liquid-fuel or ask your own question. How is a rocket engine started? How does the Space Shuttle's SSME engine's thrust vary after ignition? Do Blue Origin's BE-3 engines need to run for 7 seconds to “warm up”? How do preburners work in gas generator cycle? How does a gas generator engine begin ignition?